No parent wants to outlive his/her child, and when a child dies young the emotional blow is even greater. Death can come from many avenues, but when a tragic event could have been avoided, coping and accepting the loss is almost impossible. Florida, with its ready access to the water through numerous lakes, rivers and long coastline, is the scene of many boating accidents that can leave victims permanently maimed or dead. Typically, when someone is injured due to another’s negligent actions, he/she can sue under a personal injury claim. But, when the injured party dies, the law allows family members to step into the deceased’s shoes, and sue the responsible party for compensation. This is called a wrongful death suit, and if liability is proven, certain surviving family members are permitted to recover damages for particular types of loss. Almost invariably, these cases are directly related to tragic circumstances, and the story that made the national news of two teenage boys lost at sea in 2015 near Jupiter is again in the spotlight as the boys’ families are now involved in wrongful death lawsuit for negligence. 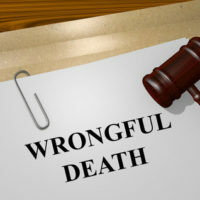 An overview of the family members that are permitted to file a wrongful death suit, and the types of damages a plaintiff may receive, will follow below. Who Can File the Case, and When Is the Deadline? In addition to the emotional devastation that comes with the loss of a loved one, financial difficulties are also a common immediate worry, particularly if the death involved the primary earner. Further, most deaths bring considerable expenses that many families do not have the resources to bear. Wrongful death lawsuits exist to help ease a family’s financial burden. Consequently, because the basis of a wrongful death lawsuit is the lost love and support of the family member, only family members that suffer a direct harm are granted the right to sue for damages – namely, spouses, children, parents and any adoptive or blood relation that was wholly or partially dependent on the deceased. In addition to limitations on who has the right to sue, the law imposes a time limit by which the case must be filed – called the statute of limitations. For wrongful death cases, the time limit is two years from the date of death, minus a few narrow exceptions, which means prompt consultation with an attorney experienced with wrongful death cases is critical to preserving the right to sue. In order to win a wrongful death case, the plaintiff must prove the defendant is responsible for the chain of events that led to the death. Negligence is the most common basis for these cases, but other grounds also exist, including a wrongful act or the breach of a contract. Familiar situations that can provoke wrongful death cases include: fatal crashes, medical malpractice and workplace accidents. Note that wrongful death cases are civil, and only entitle a successful plaintiff to money damages. A concurrent criminal case may also be proceeding under the direction of a State prosecutor, but the criminal case is completely separate. pain and suffering due to the loss. Suffering the loss of a loved one can never be corrected, but the responsible party should be required to provide some solace for his/her actions. The Miami law firm of Pita Weber Del Prado understands how overwhelming these cases are, and can provide the valuable assistance needed to get the compensation you deserve. Contact us for a free consultation.